Lot Size: n/a "Under 0.5 Acres; Dimensions: 50 x 100"
Nestled within walking distance to schools, daycare and bus routes, this well presented Cape Cod, 2 Apartment home offers great value and something for everyone. Home has seen numerous upgrades in recent years and is move-in ready. Enjoy gatherings with family and friends in the main floor space consisting of a nicely flowing family room, dining room, eat-in kitchen with patio access and sitting room with propane fireplace located off the kitchen. Upstairs you will be impressed by the charming, well appointed bedrooms to include a spacious master with his/her closets, 3 piece en-suite and additional walk-in closet with make-up vanity and window for abundance of natural light. Lower level features a rec room as well as a bright, one bedroom registered apt. Outside offers mature, meticulously manicured gardens to relax and entertain with family & friends, copious amount of parking, stamped concrete walkways and entries as well as Bell Island slate rock wall encompassing the front yard. Driveway: Paved, Driveway details: Parking for at least 6 vehicles. Not intended to solicit clients currently under contract with a real estate broker or working with a real estate salesperson. No warranties. The information provided in the web site pages is for informational purposes only. 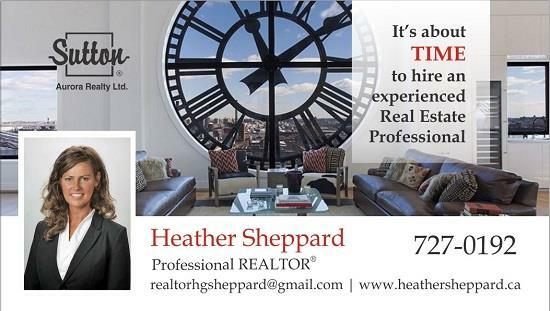 To report dead links or out of date information, please contact Heather Sheppard at realtorhgsheppard@gmail,com and every attempt will be made to correct or remove any inaccuracies. All logos are owned by CREA.